By comparing 1.6 million pairs of photos taken seven years apart, researchers have now used a new computer vision system to quantify the physical improvement or deterioration of neighborhoods in five American cities. Two street views: old photo on the left & new photo on the right. Now, in an attempt to identify factors that predict urban change, the MIT team and colleagues at Harvard University have used the system to quantify the physical improvement or deterioration of neighborhoods in five American cities. In work reported today in the Proceedings of the National Academy of Sciences, the system compared 1.6 million pairs of photos taken seven years apart. The researchers used the results of those comparisons to test several hypotheses popular in the social sciences about the causes of urban revitalization. They find that density of highly educated residents, proximity to central business districts and other physically attractive neighborhoods, and the initial safety score assigned by the system all correlate strongly with improvements in physical condition. Perhaps more illuminating, however, are the factors that turn out not to predict change. Raw income levels do not, and neither do housing prices. While the researchers found that, on average, higher initial safety scores did indeed translate to larger score increases over time, the relationship was linear: A neighborhood with twice the initial score of another would see about twice as much improvement. This contradicts the predictions of some theorists, who have argued that past some “tipping point,” improvements in a neighborhood’s quality should begin to accelerate. The researchers also tested the hypothesis that neighborhoods tend to be revitalized when their buildings have decayed enough to require replacement or renovation. But they found little correlation between the average age of a neighborhood’s buildings and its degree of physical improvement. Joining Naik and Hidalgo on the paper are Ramesh Raskar, an associate professor of media arts and sciences, who, with Hidalgo, supervised Naik’s PhD thesis in the Media Lab, and two Harvard professors: Scott Kominers, an associate professor of entrepreneurial management at the Harvard Business School, and Edward Glaeser, an economics professor. The system that assigned the safety ratings was a machine-learning system, which had been trained on hundreds of thousands of examples in which human volunteers had rated the relative safety of streetscapes depicted in pairs of images. 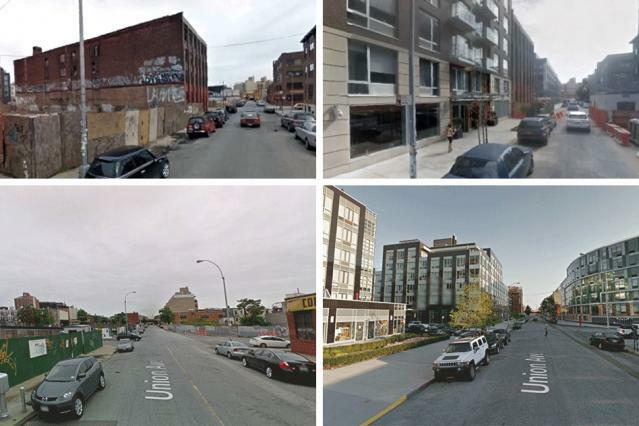 In the new study, the system compared images associated with the same geographic coordinates from Google’s Street View visualization tool, but captured seven years apart. Those images had to be preprocessed, however, to ensure that the system’s inferred changes in perceived safety were reliable. For instance, previous work from Hidalgo’s group suggested that prevalence of green spaces was one of the criteria that human volunteers used in assessing safety. But if the earlier of a pair of images was captured in summer, and the later was captured in winter, the machine-learning system might be fooled into thinking that the neighborhood had lost green space. Similarly, the prevalence of buildings with street-facing windows also appeared to increase neighborhoods’ safety scores. But if a panel truck in the foreground of an image obscured three floors’ worth of windows in the building behind it, the system might assign the image an artificially low score. So the researchers used a computer-vision technique called semantic segmentation to categorize every pixel of every one of the 1.6 million images in their data set according to the object that comprised it. If something like a truck or a pedestrian constituted too much of an image, the system rejected the image and instead compared images associated with different coordinates on the same block. Similarly, in assessing the perceived safety of a streetscape, the system ignored those parts of the image, such as trees and skies, that were too susceptible to seasonal vicissitudes. To validate the system’s analyses, the researchers also presented 15,000 randomly selected pairs of images from their data set to reviewers recruited through Amazon’s Mechanical Turk crowdsourcing platform, who were asked to assess the relative safety of the neighborhoods depicted. The reviewers’ assessments coincided with the computer system’s 72 percent of the time. But most of the disagreements centered on pairs of images with little change in safety scores; in those borderline cases, any two humans might disagree, too.